A slip ring is the electromechanical device that allows the supply of electric signals and power from an immobile structure to a rotor (rotating component). It is widely used in many of the electromechanical systems that require a continuous rotation, at the same time transferring data or signal. It can simplify the system operation, improve the performance of the mechanical systems and resist the dangling wires of the movable joints from damage. 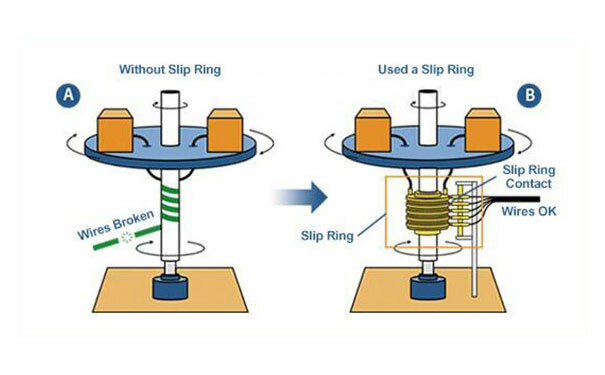 Before usage of the slip rings, it is required to know the proper slip ring assembly. The slip ring assemblies move the signal, power or data all across the slip ring by a brush, loaded contact finger, ring or spring. This acts as a medium which is the whole unit that actually causes the slip ring to work. The medium upon which the power is transmitted while rotating slip ring is set in place by a holder. These elements constitute the part of the slip ring and the housing completes the unit. 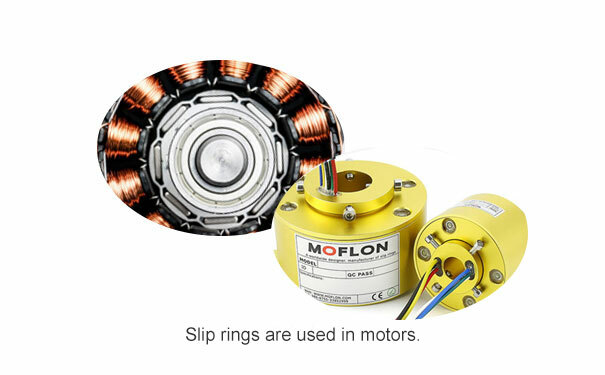 The slip ring assemblies can vary in terms of the units it includes. The basic elements of the slip ring assembly include a transferring medium which can be a spring, brush, finger or ring and a holder that can keep the transferring medium. Again, it can be a brush, ring, finger or spring. Lastly, it requires a housing that can enclose all the components. Slip ring in wind turbines generator: In wind turbines, the slip ring is the central part of the blower system, controlling the transmission of signals and data and helps in pitch control force. Marines: Slip rings are applied extensively to a crane, winch, shipborne radar and so on. Rotary table: It is also known as a swivel table. It is the working platform, that can move to different positions and keeping it fixed. It is mostly used in the surveillance and the measure and control industry. This table requires a revolving electrical connector, which is a slip ring in order to finish operating. Radar and antenna: During the operation, slip rings play an important role in the process. The radar antennal are required to detect the inclination of an objective by radiating and receiving the electromagnetic current. The slip ring is used to make a continuous flow of connection of electricity from the fixed and rotating parts of the radar and antenna. It is now understood that the functions of slip ring on any of the rotating object are basically to transfer the power, controlling circuits, digital or analog signals which include those found on the aerodromes beacons, power shovels, rotating tanks, radio telescopes or the heliostats. The slip ring is designed in various sizes and types so that each can be compatible with the different fields of utility. The various types of slip rings include through bore slip ring, separate slip ring, one with high frequency, capsule slip ring, electrical rotary connectors etc.